Britney L. Clark is a telecommunications professional, dynamic speaker, and educator. Clark received her Bachelors of Business Administration from Mississippi State University in May 2014. She worked for two Fortune 500 companies before the age of 23. She also spent almost 3 years working in the Banking and Finance industries before transitioning out in September 2016. Her licensure includes Life, Accident, and Health for the state of Mississippi and Georgia. Britney began her speaking career in 2015 with focuses on leadership development, teen girls/women empowerment, and financial planning. She has been commissioned to speak at community colleges, social impact agencies, and religious organizations. In October 2016, Britney joined forces with The Glow Exchange to take her passion for women empowerment global. Clark, along with 2 other women, raised $23,000 in 4 months to build a Centre for Women and Girls in Kasaali, Uganda. In January 2017, Clark traveled to the community with her team to lead a 2-week Leadership forum to train women in community development, dignified work and leadership. Her hobbies include all things adventure, reading, and sharing resources with strangers. Britney meeting with her camp mentors for a quick meeting on the day's planned structure. Britney shares a warm moment with one of her camp mentors and her keynote speaker, Cherry Head. 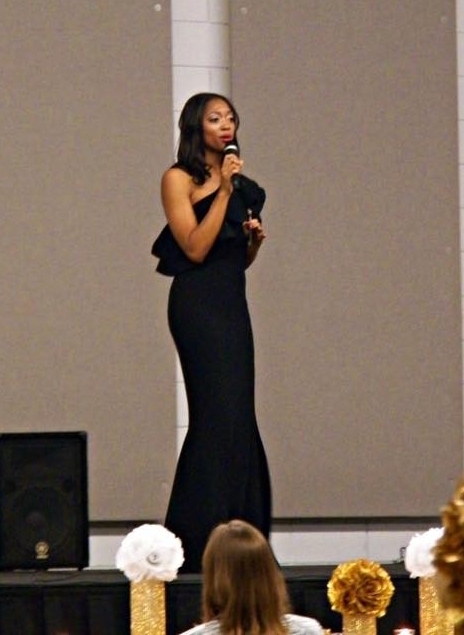 Britney sharing her story, "Journey to Africa", during her fundraising event "An Evening Under the Stars"
my goal is to assist women in realizing their leadership and economic potential to enliven the communities in which they live and serve.